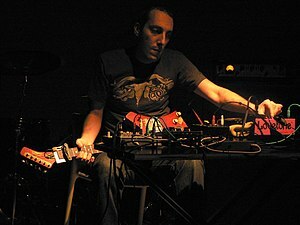 Anyone familiar with Oren Ambarchi‘s solo albums, and particularly the four he recorded for Touch between 1999 and 2007, will have become schooled in his proprietary, unconventional approach to the guitar. Following an epiphany of sorts when witnessing the unique, visionary idiosyncrasies of a Keiji Haino performance, Ambarchi ditched the drums he’d been playing on the Australian free jazz circuit to develop a six-string method he could call his own. The mesmerising results come from a similar place to Sunn O)))’s sensory ‘minimalism meets metal’ (a band with whom Ambarchi would later frequently collaborate) but with more subtle and delicate dimensions: dark bowled tones are suspended and layered to form intricate harmonic patterns that coalesce and disintegrate to produce hypnotic, transcendental experiences for the listener.